Dialysis Clinic Inc. (DCI) recently continued its commitment to Preston Medical Library by making a gift of $149,882. 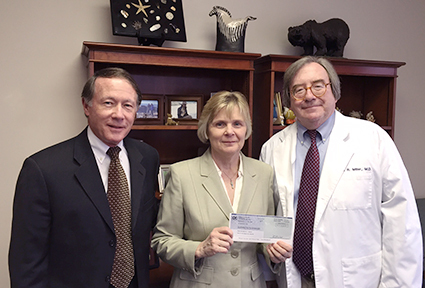 Since 1995, DCI has donated $374,882 to support the purchase of nephrology-related resources for education, healing and discovery at The University of Tennessee Medical Center and UT Graduate School of Medicine. These resources are also available for use by area physicians. DCI is a nation-wide non-profit organization formed in 1971 to meet the needs of individuals in need of outpatient dialysis. DCI is affiliated with major universities and teaching hospitals across the country, and notably, the Knoxville DCI clinics are affiliated with the The University of Tennessee Medical Center. Medical Director of the Knoxville DCI clinics, Thomas Miller, MD, and Administrator Terry Williams have continued to support Preston Medical Library throughout the years by requesting support from the DCI organizations in the form of donations to the library. The library, and the community continue to be thankful of the generosity of Dialysis Clinic Inc.
1996 – Dialysis Clinics Incorporated contributed $50,000 to the library development fund to enrich the nephrology-related resources and set up a section honoring Dr. Roland Regester. 2002 – Dialysis Clinics Incorporated agreed to contribute $25,000.00 for nephrology resources including textbooks, journals and databases each year. 2004 – A $10,000.00 gift was made for continuing the support of nephrology related journals, and databases. 2007 – A $20,000.00 gift was made to support the purchase of textbooks, journals and databases. 2008 – A $20,000.00 gift was made to support the purchase of textbooks, journals and databases. 2010 – A gift in the amount of $50,000.00 was given to support the purchase of textbooks, journals and databases. Also, funds help establish the clinical and research staff computer lab in the newly relocated Preston Medical Library. 2011 – A generous gift of $50,000.00 contributed to the designation of the Rolland F. Regester Computer Lab. 2015 – A charitable grant in the amount of $149,882.00 was given to support specific resources, including a database, journals, textbooks and patient level book on nephrology related topics. 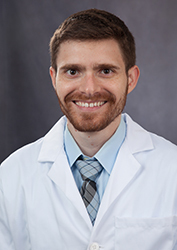 Micah Hatch, MD, second-year Anesthesiology resident, has been selected for an American Society of Anesthesiologists (ASA) Resident International Scholarship in Ethiopia. 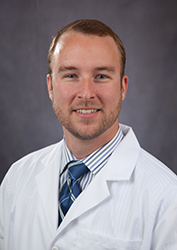 Dr. Hatch is among the first group of national anesthesiology residents to receive the scholarship from ASA’s Committee on Global Humanitarian Outreach. 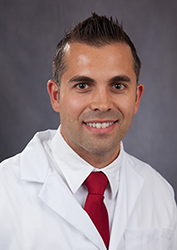 Dr. Hatch will spend one month in Ethiopia experiencing the challenges of delivering safe anesthesia in a low-resource, underserved area within a developing country as well as participate in training and education of local anesthesia providers. He will work at CURE Ethiopia, a primarily pediatric orthopedic teaching hospital in Addis Ababa under the direction of Mary Bernard, MD, an American Board of Anesthesiology-certified anesthesiologist. The program is modeled after the successful Society for Education in Anesthesia (SEA) Health Volunteers Overseas (HVO) Traveling Fellowship. 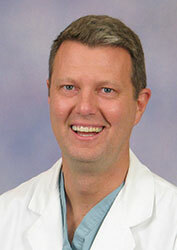 David Dahl, MD, Anesthesiology Alumnus, received a SEA-HVO Traveling Fellowship Award in 2013. Scott L. Stevens, MD, Professor of Surgery, Director of Endovascular Surgery, and Co-director of the UT Aortic Center at The University of Tennessee Medical Center, started his term as President of the Southern Association of Vascular Surgery at the organization’s annual meeting in Scottsdale, Arizona. The Southern Association for Vascular Surgery is a vascular surgical organization established to promote the art and science of peripheral vascular surgery. It is comprised of over 500 members primarily from 13 Southern states. The Southern Association for Vascular Surgery is widely considered the most well-established and vibrant regional vascular organization in the world. Dave Gerard, PhD, Professor in the Department of Oral Surgery, is currently conducting two research studies that reflect areas of great concern by clinicians in the Department of Oral Surgery. Reconstructive surgery of the facial region due to trauma, disease, or congenital defect is an integral part of oral surgery. Oral cancer, particularly oral squamous cell carcinoma (OSCC) is a devastating disease. Over 40,000 patients are diagnosed in the U.S. each year with OSCC, and the 5-year survival rate is only about 50 percent. Expression of ODAM (odontogenic, ameloblasts associated—a protein-coding gene) may play a role in determining treatment as well as pointing to other possible pathways to target for treatment. Many patients require extensive reconstructive surgery, and any technique that may enhance bone repair and healing would be of great value to oral surgeons. The first study is funded by the Department of Defense and is being carried out in collaboration with Tom Currey, MD, of the UT Health Science Center, Chattanooga. This study will examine the use of 3 polymer scaffolds produced by an electrospinning technique. These polymers incorporate hydroxyapatite (which is the mineral component of bone) with collagen (which is the primary organic component of bone) and biocompatible form of lactic acid in differing configurations. The researchers will determine, in an animal model, which scaffold configuration is most effective in treating a long bone discontinuity defect. In a second phase of the study, the most effective configuration will be tested in a larger number of animals for biocompatibility and effectiveness of bone stabilization and healing. A second study, funded by the Physicians Medical Education Research Fund, involves the examination of archived specimens of tumor samples from OSCC patients. In a small pilot study, Dr. Gerard determined that ODAM was expressed by these tumors at varying levels. 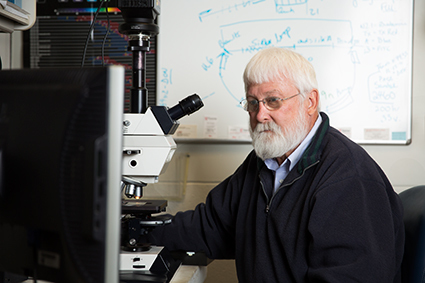 Previous studies conducted in the Department of Medicine under Daniel Kestler, PhD, retired researcher, have shown that ODAM expression may play a role as a predictor of outcome and point to possible treatment targets in melanoma and breast cancer patients. ODAM expression may have the same value in OSCC patients, and Dr. Gerard will be examining over 200 samples to determine if a correlation can be established between expression of ODAM and outcome. 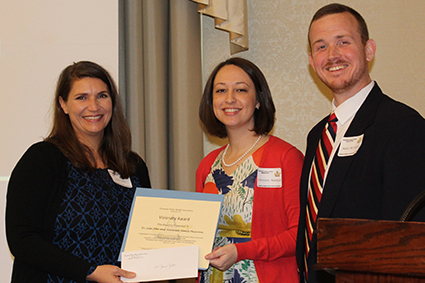 Julie Jeter, MD, Assistant Professor, Family Medicine, received the 2015 Tennessee Public Health Association (TPHA) Visionary Award at the TPHA East Grand Division Meeting. This award is presented annually in each grand division of the state as part of TPHA's celebration of public health week. This award is presented to someone who has created a healthier environment. The Visionary Award recognizes those who dedicate their time, talents and efforts to promote good health through creating opportunities in their community that improve the health of their neighbors. TPHA is the leading professional organization recognized as the voice for public health in Tennessee. Award recipients were honored at the Student Clinician's Ceremony May 1 in Memphis and will be inducted as members to the Arnold P. Gold Humanism Honor Society. 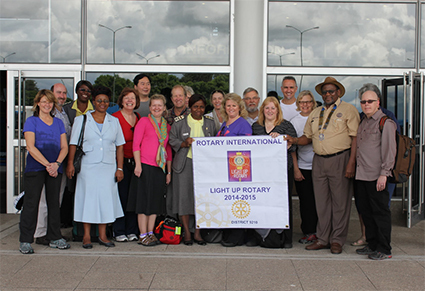 A collaborative team of health professionals from The University of Tennessee Medical Center and Knoxville area made a big dream a reality recently when they spent two weeks in Zimbabwe providing trauma training to doctors and nurses. The Republic of Zimbabwe is located in southern Africa with a relatively sparse population estimated to be 14 million. The life expectancy of Zimbabweans is 52 years of age (the lowest in the world), and trauma being one of the largest causes of death. The medical center team included: Trauma and Critical Care Surgery faculty Lou Smith, MD, Clinical Associate Professor, and Blaine Enderson, MD, Professor; and Trauma and Critical Care nurses Niki Rasnake, RN; Debi Tuggle, RN; and Theresa Day, RN. They conducted two types of training in Bulawayo, Zimbabwe, including Advanced Trauma Life Support (ATLS) training to physicians for just the third time in Africa, and Advanced Trauma Care for Nurses (ATCN) training for the first time ever in Africa. The team taught 32 nurses the ATCN course and 17 doctors the ATLS course. The Zimbabwe doctors and nurses came at their own expense from hospitals and clinics all over Zimbabwe to receive this specialized training. In the U.S. students would receive training on hi-tech manikins, but in Zimbabwe those leading the training had to improvise often by using items such as empty water bottles, Ziploc bags and empty suture trays to teach training on certain topics like lung capacity. UT Health Science Center College of Medicine Class of 2017 students recently took Step 1 of the United States Medical Licensing Exam (USMLE) with a pass rate of 96 percent, which is in line with last year's national average and will likely be determined as this year's national average. Also, average scores for UTCOM students were 233, which is statistically significantly higher than last year's national average. Clint Snyder, PhD, MBA, Senior Associate Dean for Medical Education at UTHSC COM congratulates students for their group performance. UT Graduate School of Medicine physicians collaborate both internally and externally to produce scholarly articles published within peer reviewed medical journals. Often, these articles are cited within newer articles written by other authors worldwide. This is one of the many ways our research grows beyond our institution and helps advance medicine. One example of a UTGSM-authored article that is well cited worldwide is “Prognostic Value of Breast Cancer Subtypes, Ki-67 Proliferation Index, Age, and Pathologic Tumor Characteristics on Breast Cancer Survival in Caucasian Women.” Published in Breast Journal in 2013, the article has been cited approximately 15 times in journals including The European Journal of Public Health, Annals of Surgical Oncology, Geriatrics and Gerontology International, Breast Cancer Research and Treatment, Asian Pacific Journal of Cancer Prevention, and other cancer-related journals. According to Wiley Online Library, this article is ranked in the 92 percentile for citations compared to other articles of a similar age out of more than 85,000 tracked titles. Authors include Lynn Ferguson, MD, John Bell, MD, Robert Heidel, PhD, Solomon Lee, DO, Stuart Van Meter, MD, Lisa Duncan, MD, Barbara Munsey, Timothy Panella, MD, and Amila Orucevic, MD, PhD. The University of Tennessee Medical Center has received the American Heart Association/American Stroke Association’s Get With The Guidelines®–Target: Stroke Honor Roll-Elite Plus Quality Achievement Award at the association’s International Stroke Conference 2015. The award recognizes the hospital’s commitment and success ensuring that stroke patients receive the most appropriate treatment according to nationally recognized, research-based guidelines based on the latest scientific evidence. This is the medical center’s third year to be recognized on the stroke honor roll and first year to be recognized as an elite-plus recipient. To receive the Target: Stroke Honor Roll-Elite Plus award, hospitals must meet quality measures developed to reduce the time between the patient’s arrival at the hospital and treatment with the clot-buster tissue plasminogen activator, or tPA, the only drug approved by the U.S. Food and Drug Administration to treat ischemic stroke. If given intravenously in the first three hours after the start of stroke symptoms, tPA has been shown to significantly reduce the effects of stroke and lessen the chance of permanent disability. Over 12 months, at least 75 percent of the hospital’s ischemic stroke patients received tPA within 60 minutes of arriving and at least 50 percent of the hospital’s ischemic stroke patients have received tPA within 45 minutes of arriving at the hospital (known as door-to-needle time). "With a stroke, time lost is brain lost, and this award demonstrates our commitment to ensuring patients receive care based on nationally-respected clinical guidelines," said Ann Giffin, Vice President of the Brain and Spine Institute. "UT Medical Center is dedicated to improving the quality of stroke care and the American Heart Association/American Stroke Association’s Get With The Guidelines Stroke helps us achieve that goal." The University of Tennessee Medical Center and DeRoyal Industries are partnering to bring an innovative supplies tracking system with the potential to revolutionize efficiency and patient safety in the operating room. 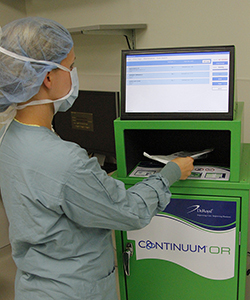 The system, Continuum®OR, created by DeRoyal and tested and refined at the medical center, uses radio frequency identification (RFID) technology to develop surgery procedure supply lists specific to each surgeon (doctor preference cards), improve inventory management and supply tracking, and enhance quality care. "As in most facilities, the tracking of supplies was primarily a manual system often performed by clinical staff," said Brian C. DeBusk, Chief Executive Officer at DeRoyal Industries. "The new system serves to automate and drive accurate doctor preference card maintenance in a way that the manual process never could." The average rate of items collected for a surgical procedure that are not used has been estimated to be as high 70 percent. As a result of the collaboration the medical center has seen improvements to operating room efficiencies and patient safety. Ashin noted the next step is to expand the Continuum®OR project through the remainder of the year to 30 additional operating rooms. The medical center also will begin tracking implants and instrument trays via RFID. The ongoing program will expand as additional benefits of having tagged supply items are identified. Cynthia Williams recently joined The University of Tennessee Medical Center as Vice President of the Center for Women and Infants. 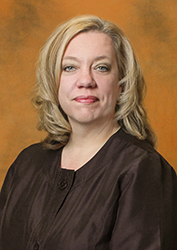 In her role, Williams will oversee all programs of that center of excellence at the medical center, including Labor & Delivery, OB/GYN services, Mother/Baby Unit, Neonatal Intensive Care Unit, Labor & Delivery, Pediatric Intensive Care Unit, East Tennessee Regional Perinatal Center, and all inpatient and outpatient services for women and infants that fall under that service line. Williams joins the medical center with more than 15 years of extensive experience across all areas of women and children’s services. Most recently she spent six years as the Corporate Director of Obstetrics and Pediatrics for Community Health Systems (CHS) located in Franklin, Tennessee. In that position Williams oversaw quality improvement in all women’s and infants programs for 206 hospitals nationwide. Prior to her time at CHS she was the Director of Labor and Delivery at Baptist Hospital in Nashville. Williams holds a Bachelor of Science degree in Nursing, a Bachelor of Education from Lakehead University in Thunder Bay, ON, Canada and a Masters of Healthcare Administration from the University of St. Francis in Joliet, Illinois. She holds a national certification in Maternal Newborn Nursing and is an AWOHNN Fetal Monitoring Instructor.